This week brought one of the final rounds of primaries heading into the fall election, with four states voting. Among those four was one of the Desk’s favorites – Wisconsin. The Badger State has both a Senate and Gubernatorial race this year – interestingly, those races feature incumbents from opposite parties. In the Senate race, Sen. Tammy Baldwin (D) is running for a second term. Baldwin was first elected in 2012, after spending several terms in the House representing WI-02 (Madison). Since then, her approval ratings have generally been lukewarm or only marginally positive. However, in midterms, Senators from the opposite party of the President rarely lose, and Baldwin has led in every poll. 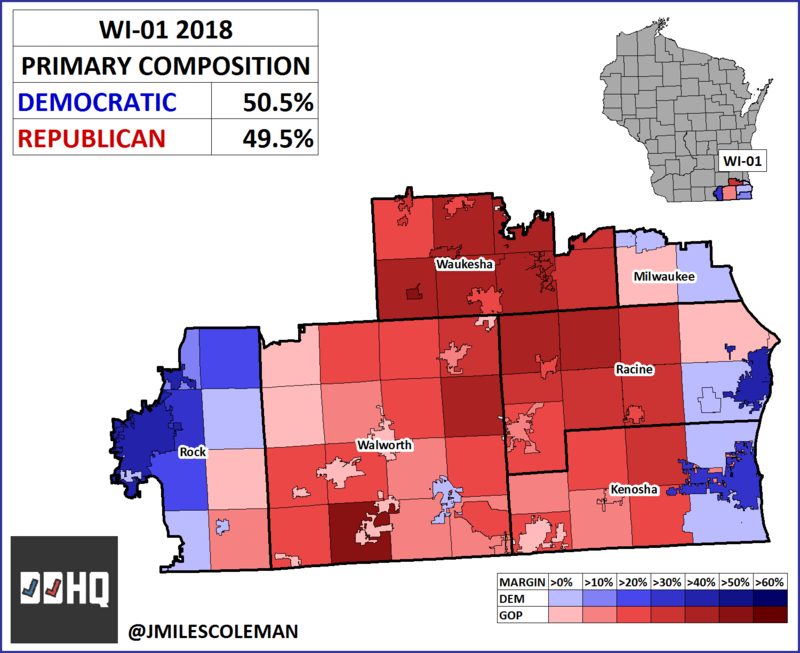 Going forward, Baldwin doesn’t seem especially vulnerable – many outlets have this races as Likely Democratic – however, it will be interesting to see what extent she can improve on Clinton’s margins in rural areas, especially given Vukmir’s weakness there in the primary. The Øptimus forecast model ranks Wisconsin Senate as Safe Democrat. Mahlon Mitchell, the runner up, was the party’s nominee for Lieutenant Governor in the 2012 recall, and hailed from Milwaukee. State Sen. Kathleen Vinhout represents a seat in the west, and has won some close races there, so had appeal in counties there. 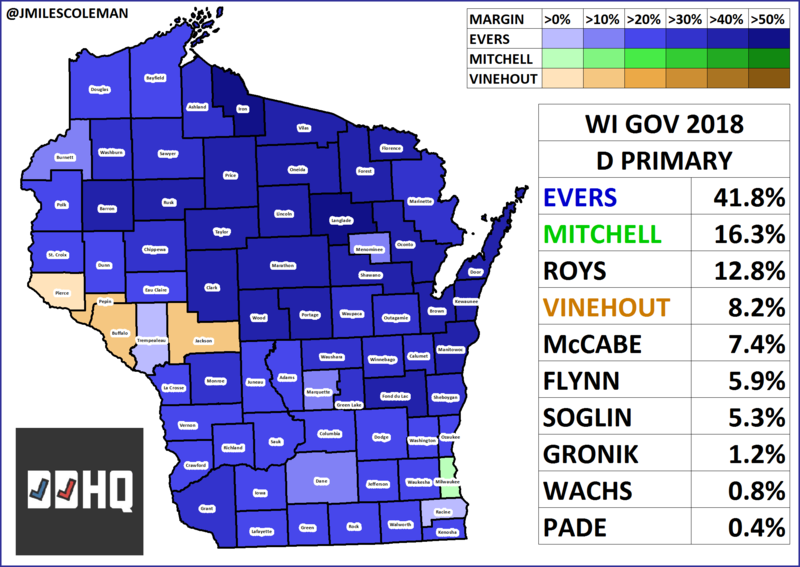 Evers carried 67 of 72 counties, and was strongest in the northeastern corner of the state, which swung hard to Gov. Walker in 2014. The Republican map would be very boring; Gov. Walker was re-nominated with 92% of the vote. 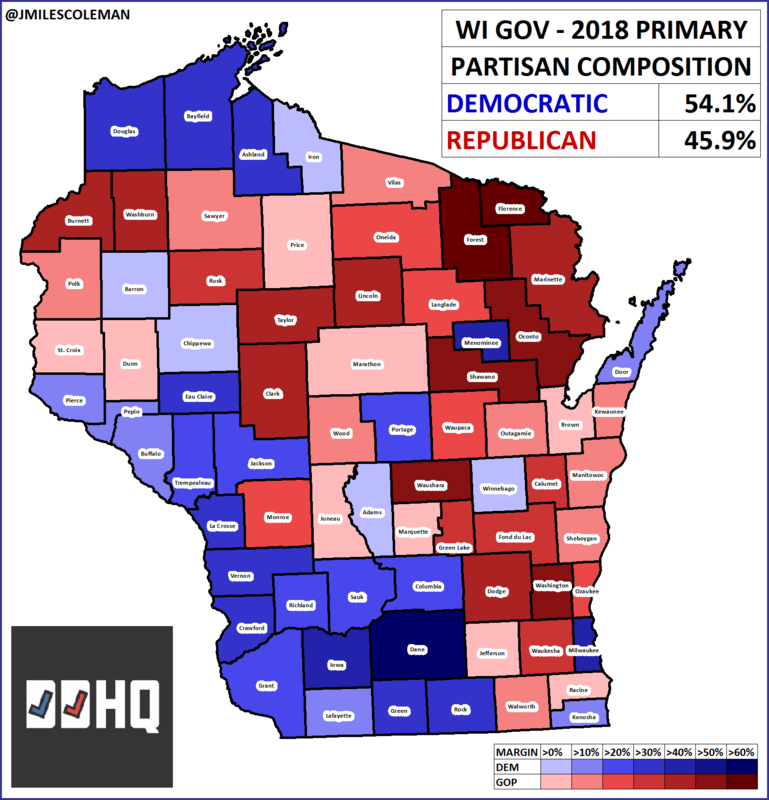 In terms of the electorate on Tuesday, 54% of the votes in Gubernatorial primary were cast on the Democratic side to 46% on the Republican side (Walker wasn’t in a competitive primary, but the GOP’s Senate primary drove turnout). In his past elections, Walker has performed well in the western part of the state, along the IA and MN border. As this region is quite blue in this map, expect that area to be heavily targeted. While Walker has a record of winning tough races, most outlets rate this contest as a tossup. The congressional seat that has gotten the most attention this year in Wisconsin is WI-01, in the southeastern part of the state. Speaker Paul Ryan (R) is leaving this seat open, after essentially having a lock on it since he was first elected in 1998. For most of Ryan’s tenure, the seat has leaned red in statewide contests, and he’s vastly overperformed the Republican baseline in his own races. Øptimus ranks this race as a Toss Up. 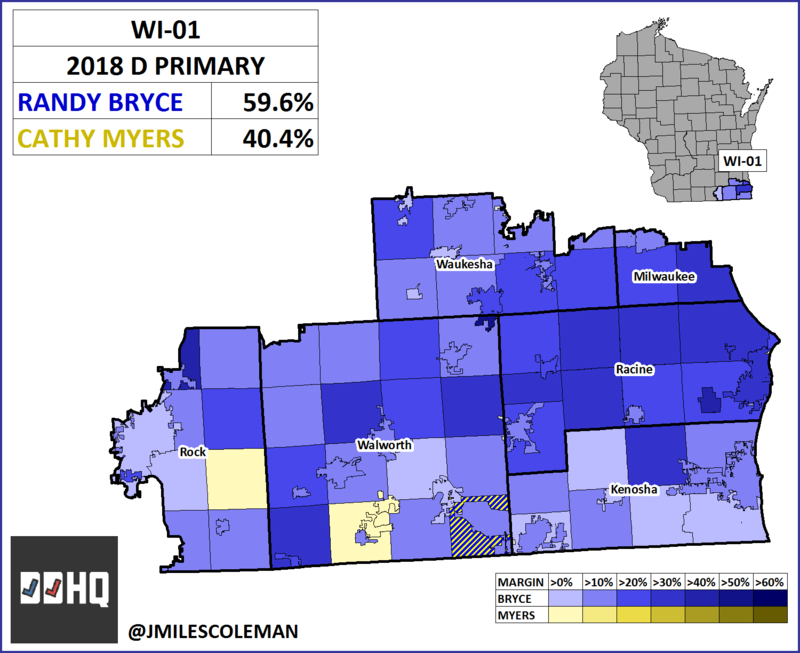 Aside from WI-01, the most competitive seat in the state is WI-06, which straddles the Green Bay and Milwaukee metro areas. Democrat Dan Kohl (the nephew of former WI Senator Herb Kohl) has consistently outraised two-tern Rep. Glenn Grothman. WI-06 is generally more Republican leaning than WI-01 in Presidential races, but more elastic in local races. Both Kohl and Grothman were unopposed in their primaries. This race is projected to be Likely Republican.